If you use Gmail, many Google services have access to your contacts list and you can easily add addresses using autocomplete or from a contact picker. But what happens when you need to enter an email address on a site that's not from Google? Many news sites have options to send a link to your friends and sometimes this is more convenient than loading Gmail and pasting a link to the article. Google Contacts Autocomplete is a Greasemonkey script that brings your Gmail contacts everywhere you go on the web. When you start to type the name of your friend or his email address, the script shows a list of suggestions. 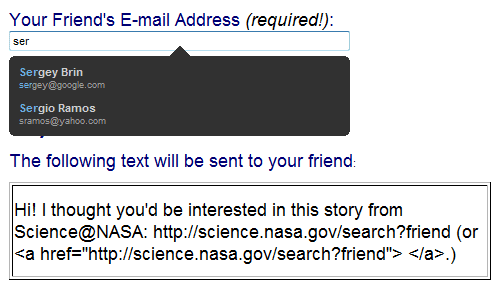 For now, the script only provides suggestions for a single email address, but I'm sure this could be easily fixed. Unlike Gmail, the script sorts the suggestions alphabetically, not by affinity. This feature would be a great addition to the Toolbar. Yes, this could be integrated with AutoFill, although it's pretty difficult to determine when to add the email address from the user's profile and when to suggest addresses from the contacts list. Wouldn't it be quite clear if the AutoFill always displayed a dropdown-list with your own address(es) on top, and your contacts' below? I made lots of updates were made according to various user suggestions including display your email address, sort by affinity, and multiple email addresses. This is cool and all, but I'm still waiting on a real address book from Google. See my blog. So you want a contact picker? Google already has one and it's used in most Google services, but not in Gmail. If you really were Sergey's friend you shouldn't post his email here. I'm not his friend, but Sergey Brin's email address is public (and obvious).